Today is the day that a promising Government could and should have made good on its promises to good governance – to say nothing of its promises to the people – to appoint and install a new Cabinet. That the ranks of Cabinet hang in the balance even today makes good reason why the ranks of Tuscany forbear to cheer. The Government wants the real Opposition to be part of the Government. A minority party with a minor fraction of our house of commons to its name wants to sit as the main Opposition. And the Legislature is looking increasingly like a charnel-house. We could call it ‘realpolitik’. You might cite ‘republican politics’. They will brand and promote it as the emergence of a ‘new political culture’. Everybody is happy that ‘it’s good for democracy’ and that national unity is the in flavour of the year. Everybody? Not this island’s watchmen, we hard few, who care more for the nation-state than national-unity governments or new political cultures with some of the old vices and a few new virtues. There is such a thing as “vox populi, vox Dei” – the voice of the people mistaking its will and that of its political favourites for divine fiat… a common enough error among the virtuous and the gullible alike. To be honest, I’m not surprised that those who are now in Govt. see what some of them might call ‘God’s hand’ in their ascendancy. Nine months ago, no one in their right mind or who claimed to know island politics would have imagined that the then incumbent regime would soon be a thing of the past. In fact, the then incumbent regime was confident that the stars foretold a starry future for itself and all its fuzzy constellation of supporters. Who would have thought that the so-called ‘January Revolution’ would have ousted an unseat-able war victor and veteran of authoritarian democracy/autocratic despotism (oh, call it what you will!)? Thing is, it happened – notwithstanding the assurances of stargazers and the sycophantic admiration of self-serving acolytes. Stranger things have happened in the nine months since the January Revolution or early ‘Serendip Spring’. A President from one party and a Prime Minister from another have worked unexpectedly well together. The latter is the thought-leader of an ideological movement to liberate Sri Lanka from a not-so benevolent tyranny’s shackles. The former is the head of a plurality of parties without a clear policy or strong principles, and he is also the chair of an ancient and now creaking Sri Lanka Freedom Party-led coalition that is on the verge of dissolution or reinventing itself outside the ambit of Sinhalese nationalism. The ship of state has had its moorings realigned – with separate berths for the respective branches of government after a decade or more of roughing it out on perilous seas in each others’ cabins! Rule OF law and order (with all their attendant frustrations over delays and procedural impediments) has replaced rule BY law and orders (the will and fiat of the ‘might is right’ brigade). Peace with justice and development is about to bring showers of blessings in a burst of summer sun. Or is it? Strangest of all has been that odd feeling that nothing has changed at the foundational, fundamental, level. That the more things change, in certain areas they remain quite the same. Ergo, despite the revival of a new hope for democracy, the damning evidence which is staring at us in the face is that human nature has not undergone a sea-change by any means. There is nothing either richer and/or stranger in the new political culture supposedly coalescing before our gobsmacked eyes. It is simply the invention of a few good men (and women, though they are fewer for a variety of demographic and party-political reasons) desirous of maintaining a desirable status quo – theirs; and no one can grumble. Except the corrupt and the crooked who look threatened to be left out in the cold... and are holding the works and the march forward to ransom. Unreasonably so, over and above the machinations of realpolitik. After all, there is no other reason one can see why nominating a small, decent, deserving, clean, and competent Cabinet has taken so long. If, in keeping with the virtues of good governance, the new Cabinet was to reflect the values of a meritocracy, we’d know by now who they are to be. If, however, by virtue (and I use the word advisedly) of managing its minority status, and manipulating its erstwhile political enemies out of the picture for the foreseeable future, and also manoeuvring its albeit reluctant supporters into a tenuous stakeholdership for the next two to three years, it has to play ball, and play the game in the same old way, that would explain a lot of the delay; and the sorry lack of a result as yet. Cunctators do delight in the delay. The polity might abbreviate that opprobrious C-term. Try it. It would also mean that the Old Guard in the Grand Old Party of local politics would have to explain why ‘consultation’, ‘compromise’, and ‘consensus’ are now the order of the day – when adversarial politics was the norm during election time. Else, why did we go through a costly election at all? Was it an exercise in futility (with each party hoping against hope for a majority of its own in parliament)? Or was it an essay of formality (whereby the electorate and watching polls monitors had to be given the illusion that there is and was and will be no collusion between the two major factions in our bipartisan polity)? It could also signify that at its heart, the UNFFGG truly believes that it is acting in the best interests of the nation, and not simply that of the UNP alone. 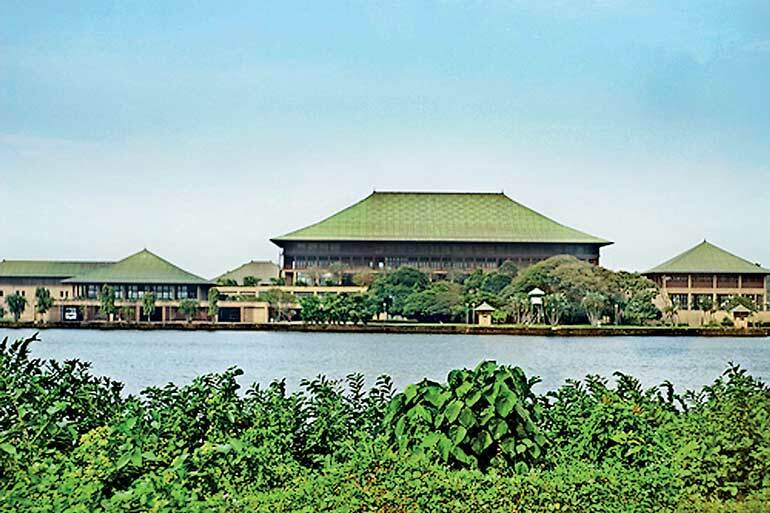 It may portend ill or well for a legislature which will be loaded with too many elected representatives of the people who have a sharper eye on win-win for the UNP-SLFP combine than is good for either the UNFFGG or the UPFA or the people’s interests. It will necessitate that government spinmeisters and/or senior UNPers maintain that this model of ‘national unity government’ was the intention all along... even if they would be hard-pressed to explain why they went it alone at election time, and why they are still vacillating between ‘promise’ (a good, small, and clean Govt. of good intentions) and ‘con-promise’ (a large, mixed, and contaminated Cabinet of necessary evils). Who knows, it may still not be too late for the UNFFGG to decide to go it alone – and take its chances at ‘national enquiry into war crimes’ times and Budget debates. To remind itself that discretion is the better part of valour, and that it is poised on the cusp of a larger destiny than shaping the legislature to fit a partisan – if visionary – agenda. It might be that there is more to the new political culture than everyone in the UNP and SLFP being in agreement on most matters. While the M-camp of the UPFA and the TNA and the JVP are left to shift for themselves as best as they can in some form of formal or nominal opposition. It would do well to embrace and espouse a grander mandate than ensuring that good governors remain in the driving seat on both sides of a House that is to be no longer divided on petty visions along the lines of persons and parties, but united in a larger, longer-term view of principle and policy. With that said, one can only hope and pray that smaller, shorter-term, petty, and individualistic rationales don’t come to dominate the Cabinet-nomination decision-making outcome. At the end of the day, a new society – both as represented by Cabinet in particular and representing Parliament in general – is a fonder dream and a much more noble ideal and goal for true democratic-republicans than would like to admit they’re uncomfortable with present pragmatic proceedings brought on by cynical and selfish motives of MPs who would be Cabinet ministers. If forming a committed and consensual Cabinet is hard, the PM and his cohorts who are bending over backward to secure that elusive two-thirds majority had better think long and hard before bedding down with flea-bitten electorate-rejected crooks – the still corrupt, the always cynical, the cavalier rogues of the old regime. If composing Cabinet is tough now, how much tougher will the Constitutional reform which is next on the cards be?